Despite the success to date, real challenges remain to sustain current progress and achieve the 2020 measles and rubella goals. One goal of the Global Vaccine Action Plan is to meet vaccination coverage targets in every region, country and community. According to the Measles and Rubella Strategic Plan 2012-2020, the goal is to achieve at least 90% coverage nationally, and 80% in every district. While routine immunization coverage with the measles vaccine has improved globally, and more countries are introducing the rubella vaccine, coverage has stagnated in some countries, and more than 20 million children are missed. Routine services must aim to deliver two doses of measles vaccine to every child. Measles and rubella elimination activities provide a unique opportunity to strengthen routine immunization systems. Innovative work is reported from Cambodia and India, for example, where measles campaigns were used to measurably improve routine immunization service delivery. Countries and partners should provide additional resources to plan and implement specific strategies to be conducted before, during and after campaigns that will strengthen routine service delivery. To this end, the M&RI is enhancing its support to countries, including support for quality campaign planning, implementation and monitoring that includes more sustainable routine immunization strengthening, and outbreak investigations that identify the gaps in immunization services and propose action plans to fill them. At about $2 to vaccinate a child, the measles & rubella control and elimination strategy represents one of the most cost-effective health interventions available. Yet, many developing countries that are facing multiple health challenges have limited funds, and financial support from the Measles & Rubella Initiative critical. Funding shortfalls and reduced political commitment in 2008 and 2009 led to widespread measles outbreaks and a setback for measles mortality reduction. In 2014, 10 countries had large measles outbreaks, including countries in the Americas, Europe, Africa, South Asia and Southeast Asia. The GAVI Alliance has made a large financial commitment to fund the introduction of rubella vaccine through wide age-range measles-rubella campaigns, and a second dose of measles vaccine to GAVI eligible countries. Additional multi-year funding is still required to reach the measles, rubella and CRS control and elimination goals. Considering the high cost of congenital rubella syndrome (CRS) to society and the fact that the CRS burden is highest in countries that do not yet use rubella vaccine, the case for the introduction of rubella vaccine is clear. In 2013, about 60% of new babies did not have access to rubella vaccine. Forty-nine GAVI-eligible countries have an opportunity to change that through Gavi, the Vaccine Alliance funding for rubella vaccine introduction. M&RI partners will work with countries to make sure they can take full advantage of the GAVI opportunities. 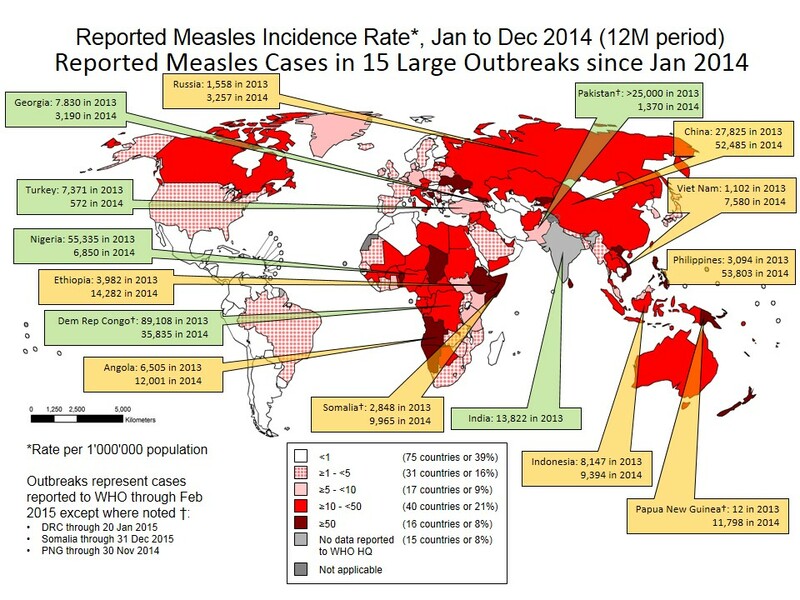 The resurgence of measles in 2009 and continued outbreaks into 2014 demonstrate that when people are not vaccinated, measles returns. Measles campaigns should achieve greater than 95% coverage, demonstrated through quality coverage surveys. The Measles & Rubella Initiative works with countries to both improve campaign quality, and to demonstrate coverage through timely surveys.